The Greater Kuala Lumpur/Klang Valley NKEA 2020 targets are to be in the top 20 most livable cities list and the top 20 in economic growth. The goals under this NKEA are to be realised through the implementation of nine Entry Point Projects (EPPs) and the two business opportunities. These include improving the city’s attractiveness to foreign multinational companies (MNCs) and foreign talent, putting in place an efficient public transport system and enhancing the ambience of the city by improving its physical environment through various initiatives. Intensive efforts are ongoing to upgrade the water quality of Kuala Lumpur’s main rivers and beautifying and developing its surroundings via the River of Life EPP, going green through the planting of more trees in the city, developing iconic places within the city and providing comfortable walkways for the pedestrians. It is envisaged that initiatives under the Greater Kuala Lumpur/Klang Valley NKEA would contribute RM190bil in GNI over the next 10 years and create over 300,000 jobs. Achievements for 2011 have been good, with 16 KPIs meeting targets. Out of these, at least eight KPIs have surpassed targets. Falling short of expectation were the KPIs for a biogas plant for food waste, improvement of pedestrian walkways, talent attraction programme and the website and portal improvement. The Government is upping the ante with new critical targets for 2012. This year’s KPIs include concluding Letters of Intent for 10 MNCs’ operational headquarters relocation in Greater KL/KV; 600 employment generation and 10 branding InvestKL activities. “For the Returning Expat Programme, the KPI is to have 1,200 expatriates return to Malaysia. The Residence Pass Programme is targeting for 800 approved passes, while the Employment Pass (Category II) intends to approve 300 passes. This year will also see the development of a diaspora database,” the report said. On infrastructure, the feasibility study for the high-speed rail was due for completion. The Government also aims to have 100% completion of land required for the Sungai Buloh-Kajang My Rapid Transit line, and all elevated civil underground and depot packages are to be awarded, among others. 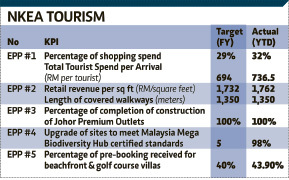 This year would see completion of the Heritage Trail Route 1 (National Museum to Medan Pasar), Reviving Medan Pasar and Heritage Trail Routes two to four, as well as the upgrading of Masjid Jamek, and land matters, planning approvals and detail design for Malaysia Truly Asia Centre (MTAC). Also, there would be a 12km upgrade of non-covered pedestrian network system. In terms of environment protection, the Government expects 15% completion of River Beautification Construction for Phase 1 under the River of Life project, and 30,000 trees to be planted. The Government also expects a 100% roll-out of Separation at Source Scheme (Household Wastes) in Kuala Lumpur through distribution of bins to landed property; and Issuance of Letter of Approval to successful contractor via Private Public Partnership for the setting up of Food Waste Treatment Plant (Composting or Anaerobic Digestion) for food waste. In addition, the Government was targeting a 45% construction progress for rationalisation projects of Old Klang Road; 20% sewer rehabilitation projects in Kuala Lumpur, Shah Alam, Subang Jaya and Petaling Jaya; and 18% regionalisation of sewerage treatment Lot 130, Klang. NANJING (China): SP Setia, Malaysia's leading property developer, is expecting its China venture to bring its overseas expansion drive to another level. SP Setia president and group managing director Tan Sri Liew Kee Sin said he hoped the company could have a meaningful involvement in the development of the newly-launched China-Malaysia Qinzhou Industrial Park (QIP). SP Setia has teamed up with Rimbunan Hijau Group to form a 45:55 joint venture (JV) called Qinzhou Development (Malaysia) Consortium. Together, SP Setia and Rimbunan will own a 49 per cent stake in a JV company to be formed with China's Qinzhou Jingu to undertake the QIP project. 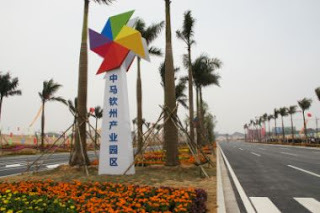 The QIP is the third industrial park in China to be developed under the umbrella of government-to-government collaboration after the China-Singapore Suzhou Industrial Park and Tianjin Eco-City. The QIP was proposed by Chinese Premier Wen Jiabao to Prime Minister Datuk Seri Najib Razak during the Malaysia-China Economic, Trade and Investment Cooperation Forum in Kuala Lumpur a year ago. Najib and Jiabao jointly officiated at the historical launch of the project on Sunday, heralding a new level of economic cooperation between the two countries. "The joint venture opportunity has taken the group's overseas expansion plans to another level," said Liew. "It will further drive us towards growing SP Setia's international footprint beyond Australia, Vietnam and Singapore." PUTRAJAYA: Twenty-one thousand houses from 100 abandoned schemes throughout the country have been revived and completed. The ministry managed to settle 100 abandoned housing projects between 2009 and this year, said outgoing Housing and Local Government Ministry secretary-general Datuk Seri Ahmad Kabit. There are 30,000 units still uncompleted in 67 other abandoned projects. “I hope the new secretary-general will be more aggressive in dealing with this issue,” he said in his speech to ministry staff when handing over duties to his successor Datuk Arpah Abd Razak here. Ahmad officially retired from the civil service yesterday, after he clocked out for the last time from a career spanning 36 years. The 57-year-old, who holds a Masters in Public Administration from the University of Southern California, had served as the ministry’s secretary-general for the past three years. Previously he had served in various capacities at both federal and state level, including at the Public Services Department, Ministry of Trade and Industry, Information Ministry and the Selangor Road Transport Department. Arpah, who was Ahmad’s deputy, will take over the post today. Having joined the civil service in 1979, she holds a Masters in Town and Country Planning from the same university as Ahmad. LONDON: A private equity arm of Goldman Sachs is looking to launch a US$3 billion property debt fund in a bid to take advantage of a growing shortage of real estate financing across the UK and Europe, British newspaper the Times said on Monday. Real Estate Principal Investment Area (REPIA) is exploring options to create a fund that would provide senior and mezzanine loans to property investors, and will target property lending that is riskier but which would offer higher potential returns, the Times said without citing sources. Mezzanine debt is commonly used to plug the gap between equity and senior debt, usually in the 60-80 percent loan-to-value band. The fund's structure and make up would be similar to another US$2.6 billion property debt fund that REPIA set up in 2009 to target U.S. property investors, the newspaper said. Europe's property industry is grappling with a widening debt funding gap, the shortfall between debt needing refinancing and the money available do so, as more banks slash lending to the sector in a bid to comply with incoming solvency regulations. Property consultancy CBRE Group estimates that there is about 960 billion euros (US$1.3 trillion) of outstanding debt secured across Europe, of which 575 billion must be repaid within the next three years. Non-bank financiers that have recently launched funds targeting the financing gap include the property units of insurers Prudential Financial and AXA Group while fund manager BlackRock said it was considering making a foray into real estate debt. Goldman Sachs was not immediately available for comment.